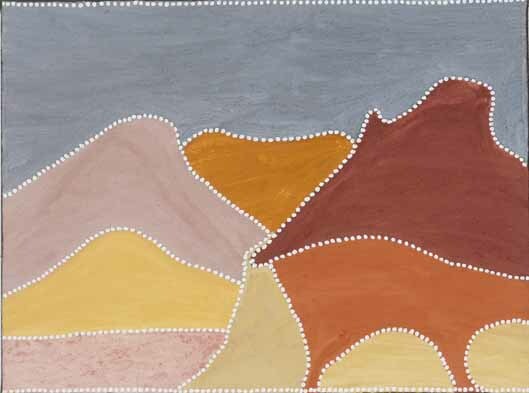 Nancy Nodea’s ochre paintings in subtle colour mixes depicting hills, trees and Ngarranggarni (Dreaming) places follow the tradition established by her older compatriot Queenie McKenzie. 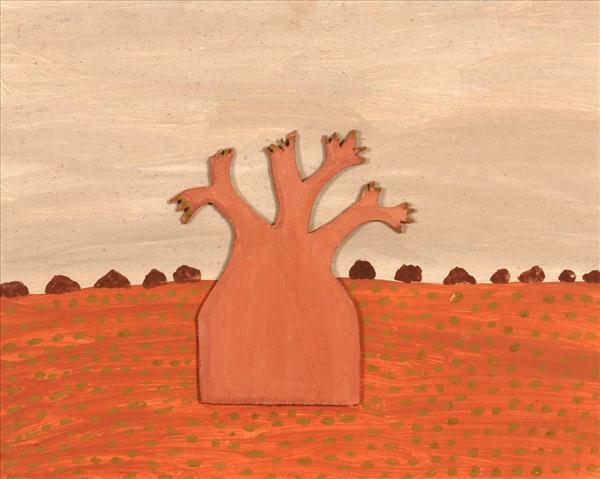 Like Queenie, Nancy was born and grew up on Texas Downs cattle station, which lies to the East of Warmun community in country recognised by Gija people as Ngarrgooroon. Nancy Nodea’s works draw on her own personal experiences as an unpaid station and domestic worker on Texas Downs cattle station, Ngarranggarni (Dreaming) stories from Ngarrgooroon country and more recent historical narratives from the Kimberley since white settlement began in the late 19th century. Though often delicately coloured and lyrical, Nancy’s work also explores dark and ambivalent beings and forces alive in her country such as the Gija woman-turned-joowarri (devil-devil), Goodbarriya, living in exile at Red Butte and the doommoorriny (spiritually dangerous) hill near Texas Downs homestead that shakes and rumbles when a Gija person dies. Nancy began painting in 1994 guided by Queenie and Rover Thomas, and has maintained a strong relationship with Warmun Art Centre since its inception in 1998. Her two sons Gabriel and Mark are both artists who also work at Warmun Art Centre.